In this case, the values in mEq/L are equal to those in mmol/L. If your results are in mmol/L, type in these values. Why is anion gap corrected for albumin? This calculator helps you estimate the anion gap based on sodium (Na⁺), chloride (Cl⁻), and bicarbonate (HCO₃⁻) levels measured in blood serum. In advanced mode, there is an option to input potassium (K⁺) and albumin levels to get a more accurate result or to see the anion gap corrected for albumin. Read on to understand the anion gap calculation, to learn what is anion gap and what is a normal anion gap. Please note that this calculator estimates the anion gap for serum anions. 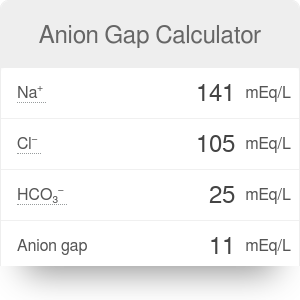 For urine anion gap, check out our urine anion gap calculator. In blood serum, the total number of cations (positive ions) should be equal to the total number of anions (negative ions), so that the overall electrical charge is neutral. However, routine tests do not measure all types of ions. The anion gap is the difference between the measured cations and anions. It is representative of how many ions are not accounted for by the lab measurements. In medicine, anion gap calculation is required when attempting to identify the cause of acidosis, which is a lower than normal pH in the blood. It is usually calculated from sodium, chloride and bicarbonate concentrations in the blood serum. To estimate the anion gap, it is necessary to measure electrolyte levels in the blood serum. The reference range when potassium is omitted is 3-11 mEq/L. When including potassium in the equation, it's 5-16 mEq/L. A high anion gap indicates high anion gap acidosis, for example, lactic acidosis or ketoacidosis. In patients with normal anion gap acidosis, the primary pathology is a drop in HCO₃⁻ and an increase of Cl⁻. It is called hyperchloremic acidosis. A low anion gap is frequently caused by hypoalbuminemia. If you're interested to know more about the correction for albumin, read this article on NCBI. Anion Gap Calculator can be embedded on your website to enrich the content you wrote and make it easier for your visitors to understand your message.